The thangka was taken down from the wall by a team of people on ladders and chairs. 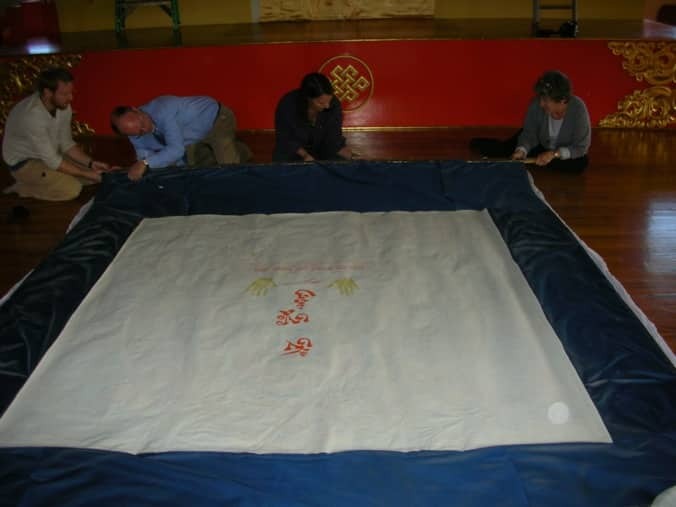 The team understood that it was fine to roll the brocade but not safe to flex the painting. 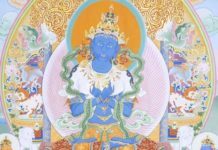 In November of 2010, I was commissioned by the Boulder Shambhala Meditation Center to plan and oversee the safe handling, cleaning and restoration of the large Great Vajradhara thangka on the main shrine. Working closely with the center Director, kasung and volunteers, we completed the preservation efforts in four days. Then Great Vajradhara was ready for photography, and safe rolling for transport to its next home. Following is a report on the preservation work that was completed. 1. 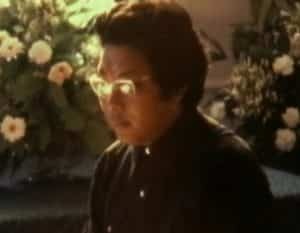 The main shrine was taken down by staff members of the Boulder Shambhala Meditation Center. 2. 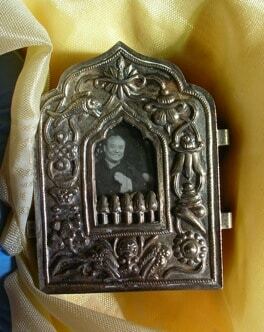 The relic box was removed from the wall by the staff. 3. The relics were carefully removed from the boxby staff members holding them respectfully with katas and placed on a worktable. 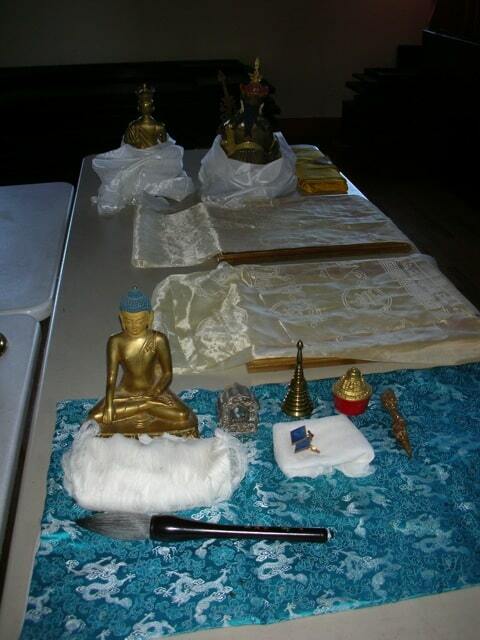 The relics were carefully removed from the box by staff members holding them respectfully with katas and placed on a worktable. 4. I inspected the relics and rupas for condition problems. I inspected the relics and rupas for condition problems. 5. I cleaned the relics and rupas by lightly dusting them with a clean brush, carefully avoiding the face area. I cleaned the corrosive silver polish residue from the gau. I cleaned the relics and rupas by lightly dusting them with a clean brush, carefully avoiding the face area. I cleaned the corrosive silver polish residue from the gau. 6. One relic, a fragment of The Vidyadhara’s samadhi robe, was found to have insect infestation. One relic, a fragment of The Vidyadhara’s samadhi robe, was found to have insect infestation. 7. I arranged to have it treated by a local insect expert who works at CU. We confirmed dermestid beetles, and selected the freezing method where the insects and larvae fall asleep in the cold and do not feel pain. 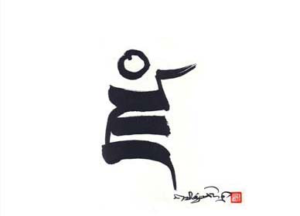 This was approved by Lama Pegyal. I arranged to have it treated by a local expert who works at CU and was willing to treat it as a courtesy. We confirmed dermestid beetles, and selected the freezing method where the insects and larvae fall asleep in the cold and do not feel pain. 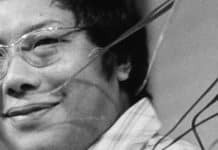 This was approved by Lama Pegyal.
. The floor of the shrine platform was cleaned. The floor of the shrine room was cleaned. I cleaned both surfaces again and inspected for dust. 9. Well-washed white cotton was laid down in front of the shrine. 10. 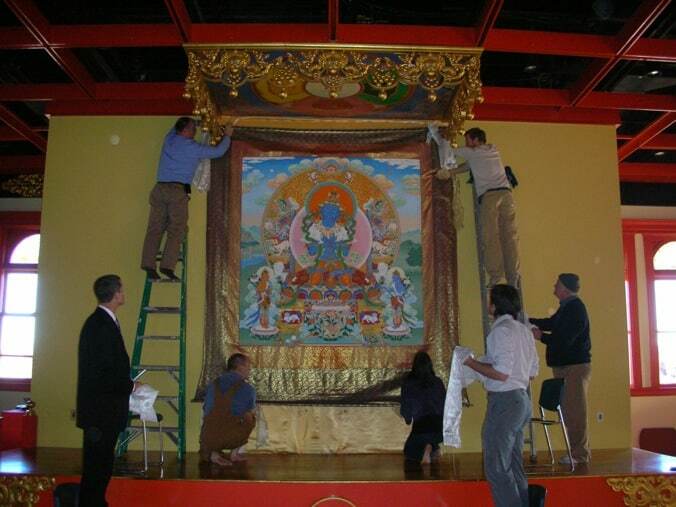 The thangka was taken down from the wall by a team of people on ladders and chairs. 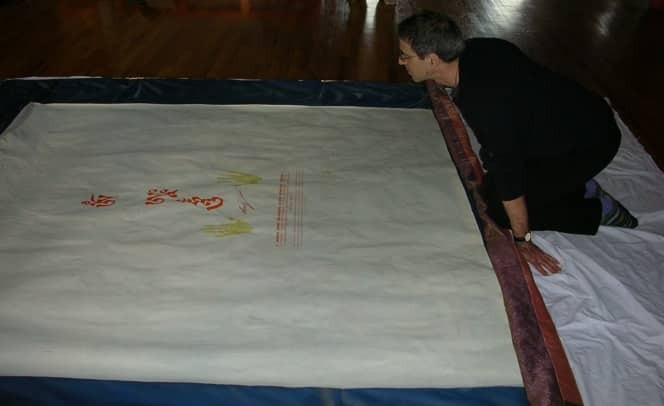 The team understood that it was fine to roll the brocade but not safe to flex the painting. 11. 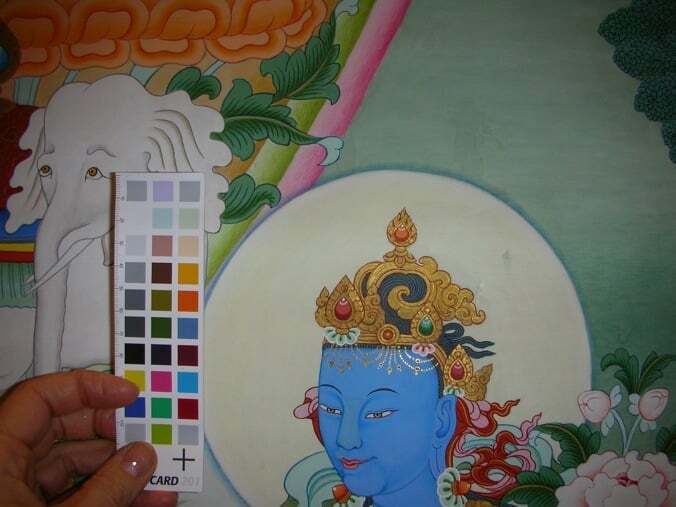 The thangka was laid with the painting face down on the clean cloth. 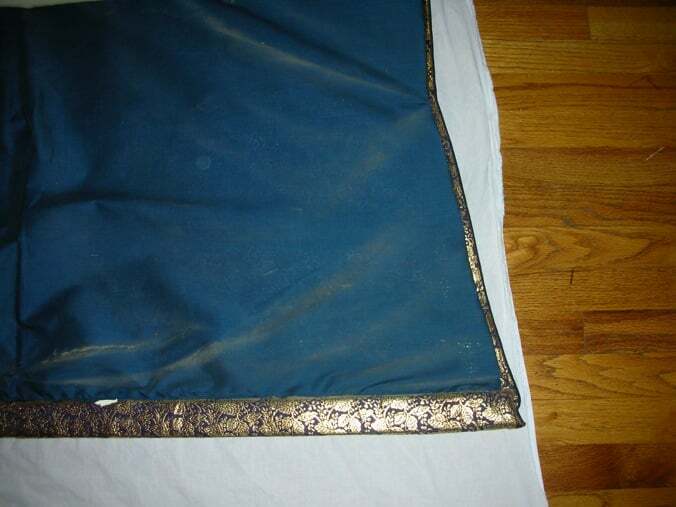 In this way, the back of the brocade and its blue lining could be cleaned. 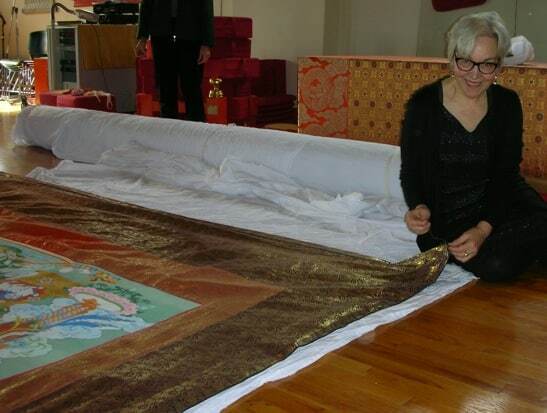 The thangka was laid with the painting face down on the clean cloth. In this way, the back of the brocade and its blue lining could be cleaned. 12. The piece of wood in the bottom dowel sleeve was removed. It was the wrong contour for a bottom dowel (rectangular instead of round), and thus it would not allow the addition of decorative finials as a round traditional dowel would. Furthermore, the thangka could be more safely rolled without the wood. 13.A digital environmental datalogger was launched and placed on the main shrine platform and later the data downloaded to document conditions of temperature and relative humidity on the shrine area. 14. The back of the brocade was vacuumed through a protective screen, using a low power vacuum. The back of the brocade was vacuumed through a protective screen, using a low power vacuum. 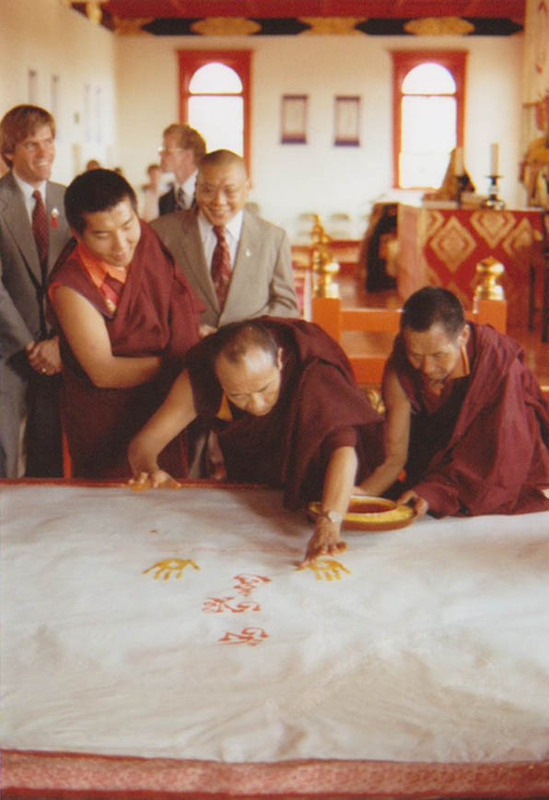 A translator, Jules Levinson, translated the verses by HH Karmapa. A recording was made of this, and notes taken as he spoke. 16. A wide diameter sono tube was purchased and cleaned inside and outside. 17. Since the thangka was not scheduled to be rolled on the tube for more than two days, the tube was not thoroughly isolated, only wrapped with polyester batting and well washed cotton. 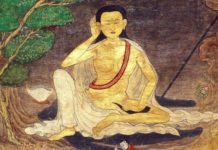 If the thangka were to be stored on the tube for a longer period of time, the tube would have to be thoroughly sealed to prevent impurities from transferring to the thangka and causing damage. 18. Mends were made to the bottom dowel sleeve. Mends were made to the bottom dowel sleeve. 19. Mends were made to blue cording on the outside of the mounting. 20. The thangka was turned over carefully. 21. The front of the mounting was vacuumed carefully through a protective screen. 22. 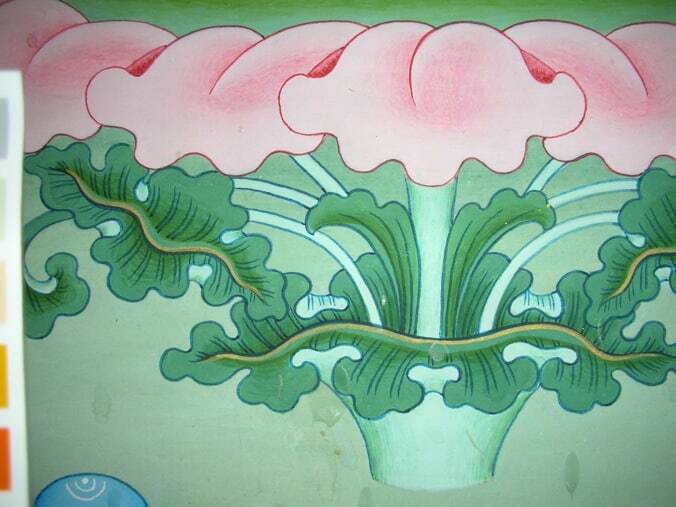 I inspected the front of the thangka and areas of damage were recorded and discussed. Damage included: fading of the painting and brocade from daylight and spotlights; tears in the brocade, and abrasion of the paint surface from choppons hanging other thangkas on top of this thangka; and staining and accretions from choppons flicking offering substances at the thangka. 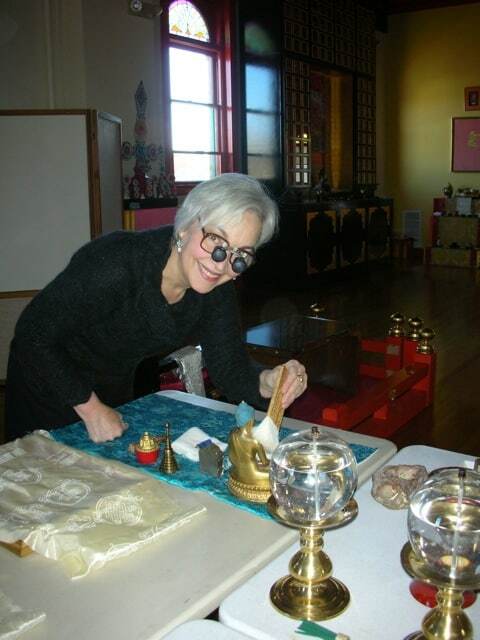 I inspected the front of the thangka and small areas of damage were recorded and discussed. Damage included: fading of the painting and brocade from daylight and spotlights; tears in the brocade, and abrasion of the paint surface from choppons hanging other thangkas on top of this thangka; and staining and accretions from choppons flicking offering substances at the thangka. I inspected the front of the painting and small areas of damage were recorded and discussed. 23. The tear and loss on the red rainbow was stabilized and mended. 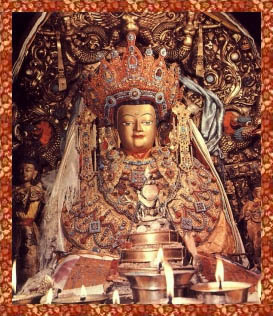 This area of damage was the result of nails being driven through the thangka to display smaller thangkas on the shrine. 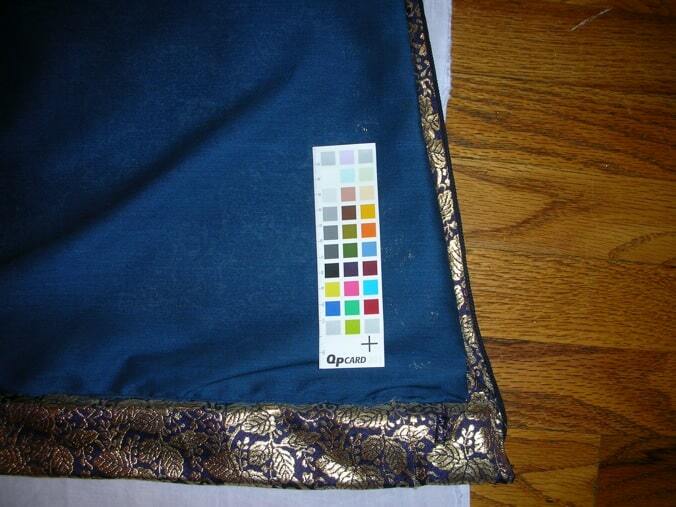 Similar colored silk was inserted and held in place with BEVA film and small stitches. 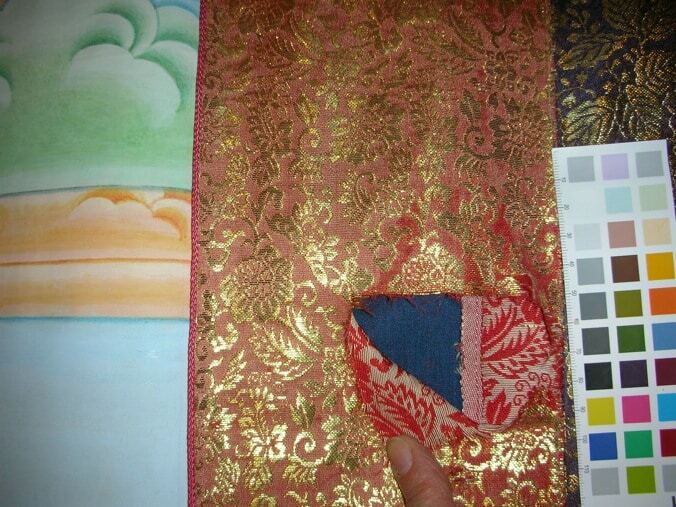 Gold floriate sections were cut from a red and gold brocade fragment and sewn into place. The edges of the fabric fills were lightly toned in with reversible acrylic paints using a tiny brush. 24. Mends were made to the bottom dowel sleeve. 25. 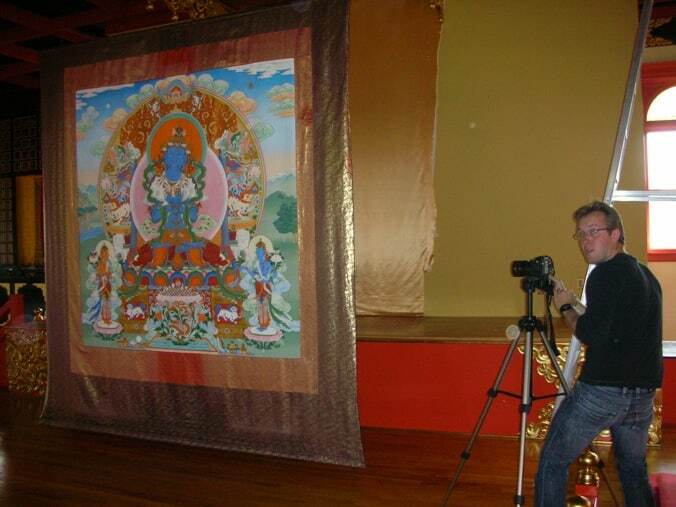 The cleaned and mended thangka was carefully hung for professional photography to document the iconography and blessing signatures. The cleaned and mended thangka was carefully hung for professional photography to document the iconography and blessing signatures. 26. 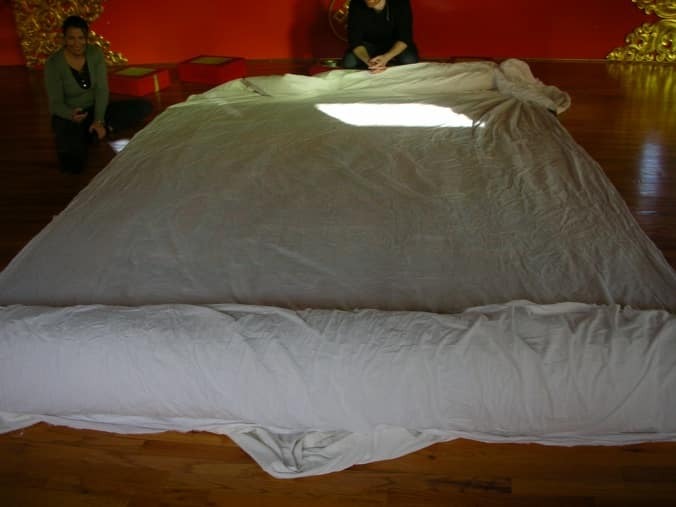 The thangka was carefully laid flat and prepared for rolling. 27. The cleaned sono tube was covered with polyester batting and then washed cotton. 28. The thangka was rolled with an interleaving layer of washed cotton. 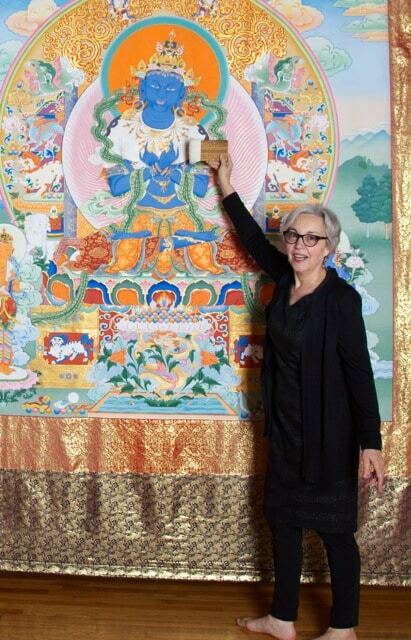 The tension on the thangka was kept even to prevent creasing the painting and brocade. The thangka was rolled with an interleaving layer of washed cotton. 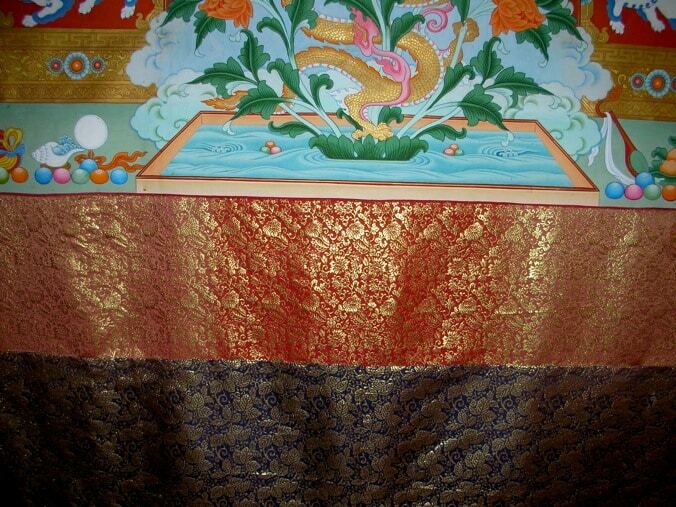 The tension on the thangka was kept even to prevent creasing the painting and brocade. 29. 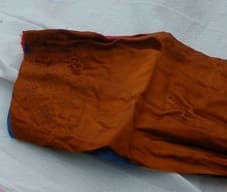 The rolled thangka was covered with washed cotton. 30. An exterior sono tube was cleaned. 31. Wooden spacers were created to keep the tubes in stable position in relation to each other. 32. The rolled thangka was inserted into the larger tube and the spacers put in place. 33. 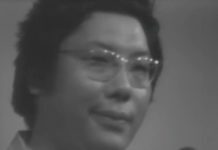 The thangka was transported to its next location. 34. The treatment was documented with a written report and photography. 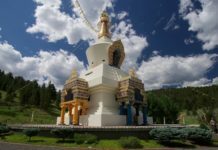 NOTES: Thank you to able assistants Jennifer Tobias and Gabriel O’Hare and Boulder Shambhala Meditation Center staff and volunteers. 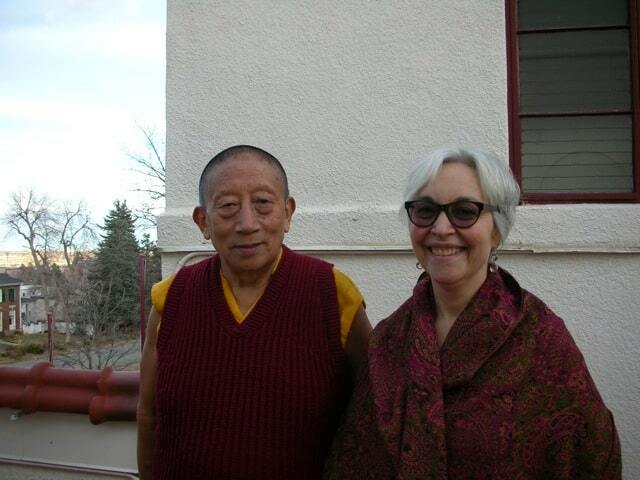 Ann Shaftel is a long-time devoted student of dharma. She is also a Fellow of the International Institute of Conservation, a Fellow of the American Institute for Conservation, and a member of the Canadian Association of Professional Conservators. She has an MS degree in Art Conservation and MA degree in History of Art. She has written and published many scholarly and practical articles, including in the Journal of Art Theft. Ann’s clients include governments, museums, universities and churches worldwide. 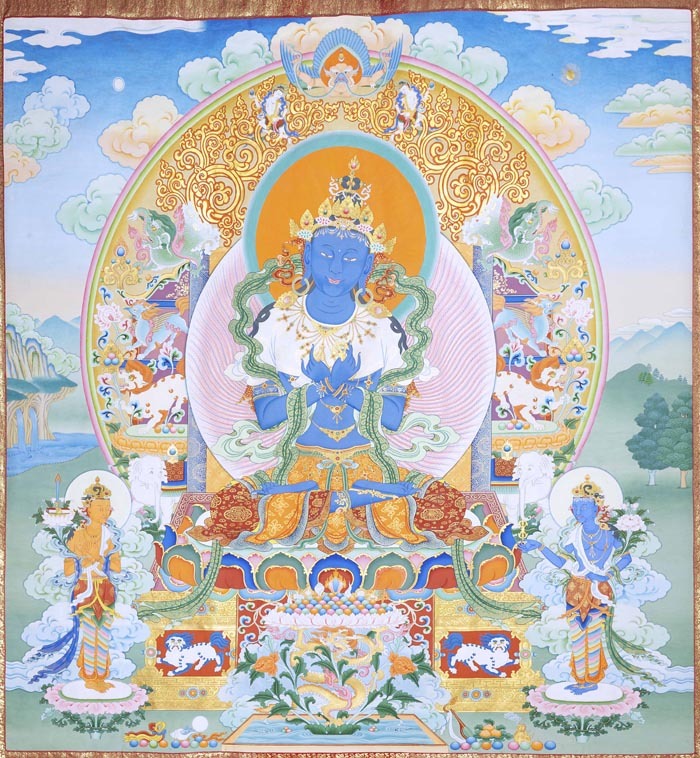 This Vajradhara thangka, which hangs in the Boulder Shambhala Center, was painted by master thangka painter Sherab Palden Beru. 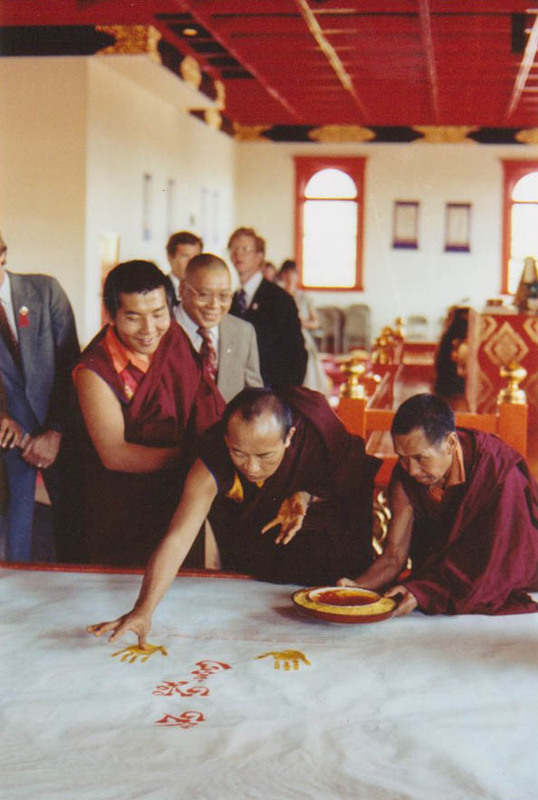 On the back of the canvas is the handprint of His Holiness the Sixteenth Karmapa. 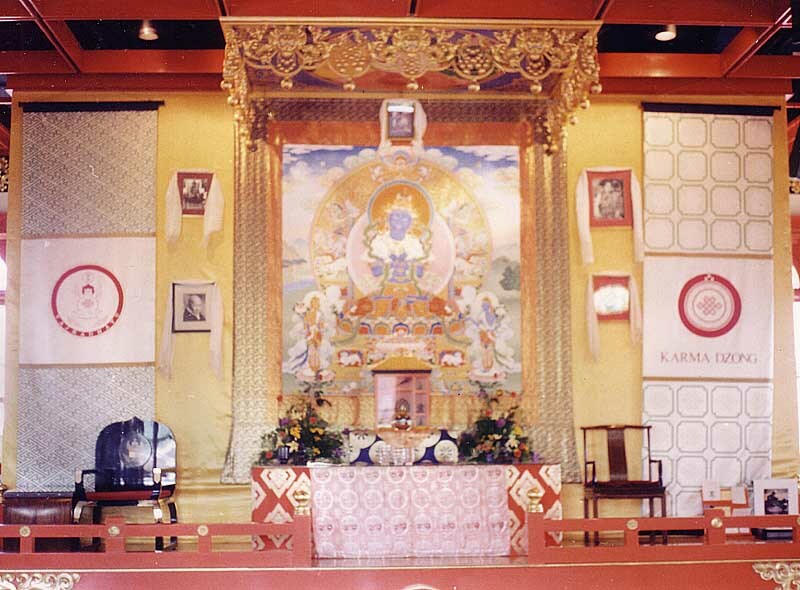 Above the thankga hangs a photograph of the Sixteenth Karmapa. 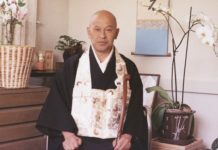 To Vajradhara's right are photographs of His Holiness Dilgo Khyentse Rinpoche (top), and Suzuki Roshi. On shrine-left are photographs of Jamgon Kongtrul of Sechen above a portrait of Trungpa Rinpoche as a young monk in Tibet.